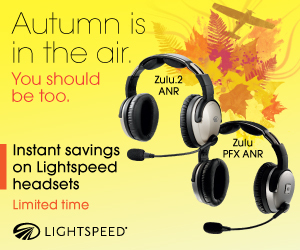 Lightspeed Autumn Special | Avionics Blog – Avionics to the Max! Autumn is in the air and that’s where you should be. Fly in greater comfort, quiet, and style! Save $125 CAD on the Zulu 2 and $170 on the PFX. Call us or come in and order yours now while the sale lasts. Offer expires Monday, November 16, 2015. This entry was posted in Avionics News and tagged airplane, autumn, Canada, efis, Flight Instruments, fly, glass cockpit systems, GPS, headsets, Helicopter, Lightspeed, Maxcraft Avionics, savings, tcas, VHF radios, Zulu PFX, Zulu2. Bookmark the permalink.